The PBS series uses celebrities, scientists, and ordinary people to explore the big questions around our emotions: What makes us happy, depressed, or anxious and how can we balance these emotions in our social relationships to become more positive and resilient? 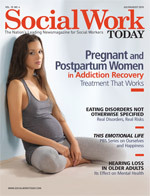 It doesn’t matter what the work setting is, effective social work practice is focused on a client’s emotional life. From schools to hospitals, bureaucracies to private practices, infants to elders, a social worker is taught to perceive and understand emotions. Even when empathy is already an entrenched skill for an aspiring social worker (as is often the case), it is almost always a requisite element of early training. We hone our empathic skills throughout our careers, recognizing that our success with clients depends on continuously deepening our sensitivity to their emotional lives. This past winter, PBS presented the six-hour program This Emotional Life hosted by Daniel Gilbert, PhD, a Harvard psychologist and best-selling author of Stumbling on Happiness. It explores ways we can improve our social relationships, learn to cope with difficulties such as depression and anxiety, and become more positive and resilient. It combines interviews with scientific experts on the study of emotions with comments by a variety of celebrities on their emotional lives. Actor Larry David, singer Alanis Morissette, and newscaster Katie Couric shared their thoughts about their feelings. As a programmatic technique to lure the viewer, juxtaposing the highbrow testimony of the scientists with the humorous observations of the celebrities is very successful. After watching David’s television character find inspired ways to bring unhappiness to himself and others, it is fun but a little peculiar to watch the real David talk with intense conviction about his prescription for happiness. Whether his tongue is firmly planted in his cheek is hard to tell. Although This Emotional Life is certainly an educational and entertaining program, it faces limitations on many issues suggested by its title. It may have concentrated more on emotional expression. Although the difficulties and complications associated with expressing anger is discussed in one section, the emphasis of the piece is on emotional regulation and control. The question of whether people today need to recover emotional vigor and passion is not given enough emphasis, especially in our era of “anger management.” Cultural factors influencing emotional expression are also not given sufficient explanation. Obviously any television program seeking a large, public audience can’t examine everything. The producers of this show should be given credit for packing as much information into the program as they did. Often the most compelling portions of the program involve personal stories. These vignettes complement the discussion of each major topic and follow people attempting to come to grips with the dysfunction and hardship caused by emotional trouble. Their presence adds a human face to the program but also clearly demonstrates the effectiveness and limitations of therapeutic techniques available to address these difficulties. These scenes are also effective at addressing the many common misconceptions associated with certain therapeutic approaches, from electroconvulsive therapy to medications to psychotherapy. One of the program’s key themes is the importance—even ultimate significance—of life’s social side. When the show’s focus turns to understanding what makes us happy, the decisive factor is the presence of fulfilling relationships. We need others, and our need for attachment and nurturing during our earliest stages of life is critical. The famous Harry Harlow experiments with rhesus monkeys are shown to demonstrate the consequences of maternal separation and social isolation in young primates. Even more dramatic as a demonstration of how a lack of attachment in infancy fundamentally shapes our ability to build future relationships is the program’s segment on the McCormick family, who adopted a 2 1/2-year-old boy from a Russian orphanage. Alex was neglected and heavily medicated during his time in the orphanage. Although the McCormicks provide a positive, nurturing family, Alex’s behavior becomes more difficult and problematic as he grows older. He is diagnosed with reactive attachment disorder, which is characterized by serious problems emotionally attaching to others and a purposeful detachment from the primary caregivers. The program shows considerable therapeutic work, particularly family treatment. Most programs about social problems made specifically for televised mass consumption minimize the complications, maximize the drama, and guarantee a tidy resolution. To its credit, This Emotional Life does not always take this approach. The program honestly shows the emotional consequences of Alex’s detached behavior on his adoptive family. There is considerable pain for the parents as they discuss on camera their disappointment with what being a parent has become. It is substantial and tiresome work to correct and redirect Alex’s actions. Alex and his parents are shown struggling with their challenges and acknowledging that there is considerably more to do in the future. Although the program emphasizes the significant link between emotional happiness and social relationships, there is limited discussion of the various contemporary factors that hinder social lives and emotional health. It would have been interesting for the program to focus on topics such as the frantic pace of modern life and the growing reliance on technologies, particularly social networking websites, to stay socially connected. According to Jacqueline Olds, MD, and Richard Schwartz, MD, who reviewed the research about the Internet and social networking sites in their book The Lonely American: Drifting Apart in the Twenty-First Century, some forms of technological communication can help supplement existing relationships, but when indulged in too often or used as a replacement for face-to-face communication, it can actually increase experiences of loneliness. Where are we headed when our social attachments are primarily electronic rather than physical? Will electronic socializing lead to an erosion of our abilities to relate and live in close contact with each other? How will social networks impact our capacity for happiness? It is noteworthy that most of the discouraging emotional trials faced by the people featured in this program, such as the McCormick family, are made less difficult by their level of education and their financial resources. Unfortunately, there are many people facing comparable difficulties who are not as educated or as well off financially. Social work professionals are on the front lines in these circumstances, working to protect, support, and provide some oversight for our most vulnerable children. Thousands of social workers, in positions that provide very little respect or financial reward, supply essential services within child welfare agencies and often-dysfunctional foster care systems. This Emotional Life provides a reminder that child welfare social work is indispensable, both for the immediate, concrete services and the preventive benefits that result from insuring a focus on nurturing relationships. The fact that most of the video’s real-life examples come from affluent, educated backgrounds is a minor criticism of this program. Social workers recognize that a significant number of people who experience the symptoms discussed on the program—phobias, explosive anger, depression—are often not in a financial position to avail themselves to treatment or they are unfamiliar with the resources that could address their problems. In many communities, a social worker is the most knowledgeable and effective resource for linking people with appropriate resources. But adding a narrative about ease-of-access issues to the portrayal of an already-difficult emotional problem runs the risk of overshadowing and obscuring the program’s purpose. Perhaps there could be a follow-up program with episodes focused exclusively on the poor and working class. Such a program would have to explore the additional social, economic, and educational obstacles complicating the emotional lives of our poorest citizens. An important conclusion of This Emotional Life is that all emotions have a role in a healthy life. Of course, we often work very hard to avoid the more unpleasant emotions such as anxiety, fear, anger, and sadness. The program has a gripping segment about a young female college student who has developed a fear of flying. Her phobia becomes more troublesome as she gets older and wants to visit friends and family. She is very bright and self-aware. The fear that she experiences is irrational but nevertheless very real. The more she doesn’t want to experience the fear and resists it, the more completely and intensely it presents itself. We are privy to her treatment—an intensive program that involves daily sessions—to overcome her fear of flying. The therapeutic approach includes cognitive behavioral therapy paired with exposure to flying as she eventually takes a trip on a plane with her therapist. An important aspect of cognitive therapy includes regulating her emotions through a technique called reappraisal. This technique involves stepping back and concentrating on thinking when an unpleasant emotion is experienced. The thinking emphasizes having a neutral perspective on the emotion. This is done to counteract the unpleasantness and other negative cues associated with the feeling. Reappraisal allows the student to begin distancing herself from her fear. Stepping back from the feeling but not ignoring it allows for the fear to have its place but not all the power. It is enthralling as an observer to watch the student take concrete steps, with the aid of her therapist, to get on a plane. Not surprisingly, the intensity of the fear increases as the prospect of flying draws closer. The student understands that if she attempts to get away—that is, run from the fear—it only becomes stronger. She is able to sit on the plane with this emotional impasse. Her therapist is supportive and encourages her to talk, as best she can, about her feelings. She puts into words a muddle of sensations and struggles that are to be expected at such a defenseless time. The scene is an excellent example of how true courage and strength are tied so closely with vulnerability. Another assertion of This Emotional Life is that emotions can be studied scientifically and that a scientific approach to the emotional life is not only valuable from the understanding we gain but from the improved psychotherapeutic and behavioral interventions we can develop. Throughout the program, the question of why we experience certain emotions is discussed. This question leads to further scientific study of the genetic and gender differences that influence behavior. An example is a recent study at McGill University, which was featured in the May 11 issue of The New York Times. Researchers looked at how men and women react differently when they perceive that their spouse may be cheating. They found that women were much more likely to perceive a threat to their commitment, and they developed a kind of early warning system to protect the relationship. The men, however, did not. There is an excellent example of science improving psychological treatment with a segment investigating stress hormones and their connection with emotional memories. This scientific work has lead to effective treatment of posttraumatic stress disorder (PTSD). As a result of a new treatment approach, we observe the emotional and behavioral improvements of a Vietnam War veteran who has suffered for many years with PTSD. The “why” question also leads to inquiries into the original function of certain emotions. For example, thousands of years ago, fear and the impulse of “fight or flight” may have been adaptive. Today, experiencing fear may cause the same chemical reactions in the body, but the behavior associated with the fear may no longer be adaptive. Fortunately, we learn; we resist initial responses and develop appropriate adaptive behavior. Although he is not a primary subject of This Emotional Life, it was Sigmund Freud who insisted 100 years ago that the scientific method was the best way of understanding our emotions. Early social work practitioners were steeped in Freud’s psychoanalytic theory. They understood his description of the emotionally healthy human being: having the ability to love, work, and put the two in balance. Love and work are the cornerstones of our humanness. This description of emotional health beautifully captures our need for both attachment (love) and exploration (work), for a self in relationship with other people and with the larger environment. This Emotional Life presents an exceptional review of our central emotional and social challenges. Social workers will find it personally beneficial and professionally useful. — Robert DeLauro, MSW, ACSW, is a freelance writer and consultant with the Labor Management Project in New York City. This Emotional Life was conceived by Paul G. Allen, cofounder of Microsoft. His Vulcan Production team has produced numerous documentaries, including Cracking the Code of Life, Inspirations, No Direction Home: Bob Dylan, and The Blues. This Emotional Life took five years to create, three years of planning and preproduction and two years of filming and editing. I had the opportunity to speak with Graham Judd, the senior producer from KunhardtMcGee Productions, who was in charge of filming for the ambitious project. Judd had six producers working for him. They shot all the video involved in the project, including the narration of the host, Daniel Gilbert, PhD, all the celebrity interviews, and the personal stories. He said it was challenging to find participants for the personal stories. They relied on the suggestions of reputable clinicians and academics. They not only needed families who were willing to allow a film crew into their lives but who were also at the “right point” in their therapeutic journey for the purposes of the program. Not surprisingly, a primary motivation for the individuals and families who agreed to participate was the opportunity to counter the stigma associated with emotional problems. The sensitivity required to film the personal stories can’t be overstated. The six producers built trusting relationships with the participants over the average three to six months of filming time and worked hard to remain as unobtrusive as possible. Another challenge they faced—and they recognized this when planning the project—was filming an unpredictable therapeutic process and outcome while trying to capture specific ideas for the content of the program. Judd said the response to This Emotional Life has been surprisingly strong and positive. The DVD is selling well and many people have commented that the program provided valuable information and possibly their first opportunity to hear an honest and open discussion of emotions. I asked him how he knew when the filming for the project was complete. He said with a project like this one, it is never really finished, just abandoned. Fortunately, it is possible to continue learning about many of the topics on the program’s website at www.pbs.org/thisemotionallife.